Seamless inner groove copper tube is used to increase the heat exchange rate by reducing the space between the fin and the copper tube. Highest quality compressor in the world. 1 Year fan motor and parts warranty. Protects aluminum and copper pipes from toxic gases generated from foods, retards refrigerant leakage, and prolongs the cooling capacity. Allows safe storage of foods with a feature that self-adjusts the circulation of refrigerant as the internal temperature changes, thus recovering the required temperature fast. 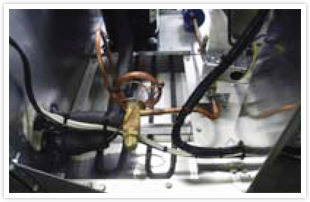 Decreases the inflow of refrigerant into the compressor when it is restarted after a stop. This extends compressor life and reduces compressor failure. The condenser's efficiency affects most of the refrigerator's performance. 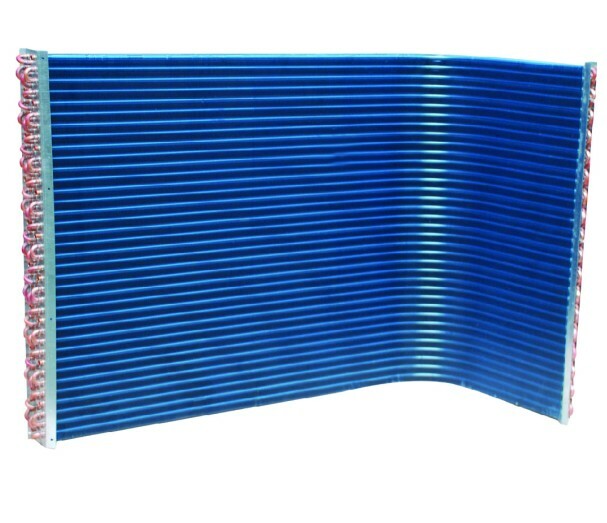 Particularly, when used in a small compartment under high ambient temperatures or a dusty area, the package unit's condenser needs to be bigger than standard ones in order to get the best performance. In consideration of the environments that our products may be subject to, condensers utilized in our products are 18% larger than competitors'. Through the use of a highly efficient EC motors, our products reduce energy consumption and lower electricity costs, thus protecting the environment. 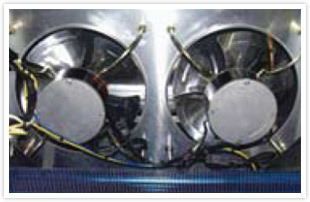 Our products are designed with easy to replace motor and fan blades. The hot gas condensate system is an Ideal system because of its fast evaporation of condensed water and its enhancing refrigeration efficiency. In spite of these advantages, many companies have stopped or stop the application of such a system because of its high risk of discarding the refrigerators due to the rapid corrosion of hot gas lines causing refrigerant leakage and water inflow into the cooling pipes. Such problems as this are completely resolved in our products, thanks to a patented technology that prevents pipes from corrosion. 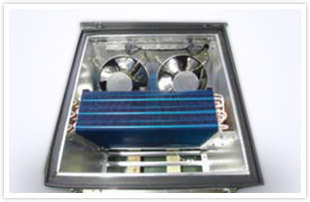 Is designed to release hot air to the outside faster than competitors and to enhance the cooling efficiency. 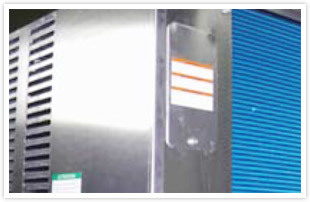 At the same time, it retards elevation of compressor temperature and keeps refrigerant pressure from increasing, thus saving energy as a result.